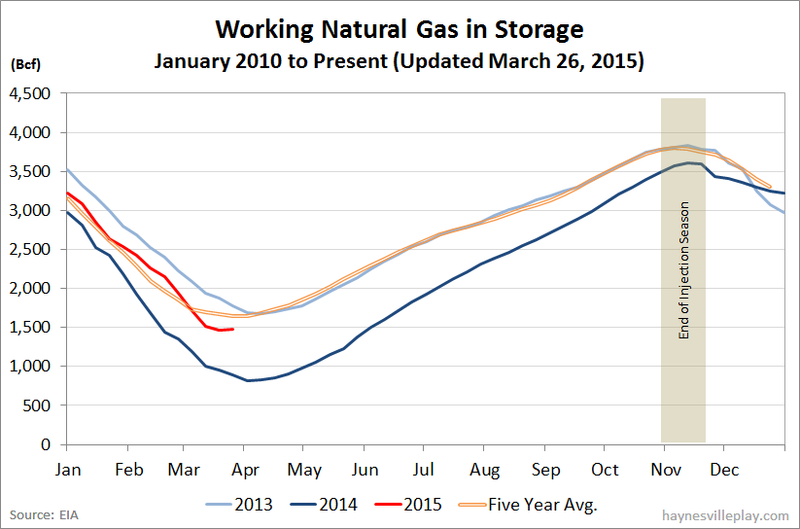 The EIA reported this morning that working gas in storage was up 12 Bcf to 1.479 Tcf. The withdrawal was net 68 Bcf greater than last year (-56 Bcf) and net 31 Bcf above the five year average (-19 Bcf). This is the first net injection of the year and the upward turn is about a week earlier than average in terms of timing for the past seven years we've been tracking it here on haynesvilleplay.com. The current storage level is now 63.6% higher than last year (904 Bcf, a difference of 575 Bcf) but 11.6% below the five year average (1.692 Tcf, a difference of 194 Bcf). FYI, last year, storage report bottomed out at 822 Bcf in the first week of April. Last week's temperatures in the Lower 48 averaged 50.4 degrees, which was 8.6 degrees warmer than last year and 5.9 degrees warmer than average.